Mark's Tickets is the best place to find tickets for Philadelphia Eagles fans. Just check this page for any new events or schedule updates throughout the year. We sell tickets to every Philadelphia Eagles game around the world. 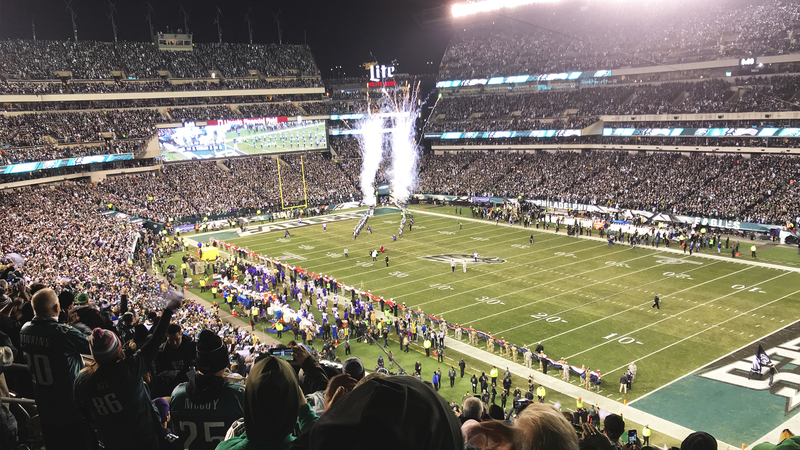 We know how passionate Philadelphia Eagles fans can be about football, so we make sure to have hundreds of tickets for every game available right up until it starts. For those looking for cheap Philadelphia Eagles tickets, we offer tickets starting at very low prices (many times below face value). We offer tickets in most sections of every venue that you can see Philadelphia Eagles. Simply choose the city or venue that you are interested in below, and you will be able to see all of the available seats. Do not forget that Marks Tickets also specializes in sold out Philadelphia Eagles tickets. No longer will sold out shows prevent you from seeing Philadelphia Eagles. The Philadelphia Eagles are a professional football team that plays in the NFL. The Eagles play their home games at Lincoln Financial Field in Philadelphia, Pennsylvania. With 16 games per year, and 8 being home games, The Philadelphia Eagles are a professional American football team based in Philadelphia, Pennsylvania. They are members of the East Division of the National Football Conference (NFC) in the National Football League (NFL). The Eagles have won three NFL titles and made two Super Bowl appearances, losing both (in 1980 to the Oakland Raiders and 2004 to the New England Patriots). The club was established in 1933 as a replacement for the bankrupt Frankford Yellow Jackets when a group, led by Bert Bell, secured the rights to a NFL franchise from in Philadelphia. Heretofore, Bell, Chuck Bednarik, Bob Brown, Reggie White, Steve Van Buren, Tommy McDonald, Greasy Neale, Pete Pihos, Sonny Jurgensen and Norm Van Brocklin have been inducted to the Pro Football Hall of Fame.